Besieged residents of the Syrian city of Homs are crying out for Western intervention to save them from being slaughtered at the hands of Bashar al-Assad. There are calls for “unilateral American and British intervention” after the shameful Russian and Chinese vetoes at the UN, and further pleas for a no-fly zone, which could result in up to “70 per cent” of the Syrian Army defecting. Death stalks Homs, which is under its fiercest attack of the 11-month uprising; the BBC’s Paul Wood says there is now “nowhere to hide” for the city’s people. “As an activist and a coordinator for the Khaled Bin Waleed brigade, I state that we in Homs, Idlib and Damascus suburbs call for unilateral American and British intervention. We also want to improve our relations with the US administration and people after the revolution, but we need you to save us. • A no-fly zone to stop the regime from using its aircraft to conduct reconnaissance, offload security personnel and – yes – strafe rebel strongholds from the sky. “I’ve been up from five o’clock am from the rockets, they started hitting us with rocket launchers from five am, more than 300 rockets have landed in just this area I’m sitting in in Baba Amr. I went to the field hospital at seven am, more than 25 pieces of bodies, children, women, men, dead people, either by shelling in their houses – the rockets either killed them in their houses – or the sniper even shot them. “One of my friend’s dad died by a sniper. He was crying and he was asking me, he wanted a pen, he just wanted a pen to write on the cover of his dad because they’ve got a sheet around his dad, he wanted to write his dad’s name on the cover, that’s all he wanted, a pen. “There’s bodies. Until now, the bombardment hasn’t stopped by rockets, this is the first time they have hit us with rockets. They used to bombard us with, for six months, they have been bombarding us with tank shells and mortar bombs, but today they started with rockets, rocket launchers, this is after what the UN did two days ago, what the UN cited, the UN gave our regime the green light to kill, the UN gave the Assad regime to kill more, they gave him the ok, they told him that no one’s gonna, gonna do anything about it, no one’s gonna help the Syrian people. “All we’re asking about is help, they’ve hit part of the field hospitals, it’s not a normal hospital, it’s not a private hospital, it’s not a government hospital, it’s one of the field hospitals we have here in Baba Amr, we did it in one of the civilian houses, he had allowed us to do a field hospital in his house, one of the rockets landed in that field hospital, killed the doctors and killed the nurses and the patients in it, now we have only one field hospital left in Baba Amr. “You should see all the injured people on the floor, we have no place to put them, some of them are dying from a stupid injury like a bullet in the leg, or a bullet in the hand, cos we have no time to rescue them, we don’t have enough doctors, we can’t even stitch up their wounds, there’s so many injuries, there’s more than 20 bodies unknown, we don’t know who they are cos their faces are blown up, the pieces of bodies, you should see the bodies we have here on the ground, you can’t move them. “They [the Free Syria Army] can’t do anything about this, this is bombarding from 15 kilometres away, how are they gonna stop rockets from landing on civilian houses, they cannot attack, as we explained a long time ago, the Free Syrian Army here, are here to defend only, they can defend, they can defend us from the army coming in, but they can’t defend us from bombardment, even they can’t do anything now, all they have is some Kalashnikovs and some RPGs and just now I saw what President Obama said on TV, that they wanna do, they wanna solve this problem without any military, without any military problems between them and Syria. “Let me just say something: this Syrian regime will not go down, they will not leave without force, without military hits, we need no fly zone, which we don’t have; if we had no fly zone 70 per cent of our Syrian Army will defect with their heavy artillery and their tanks but they can’t because they will be hit by planes, until now we’re being bombarded. “Syrian state television denied that there had been any bombardment. It said residents were setting fire to piles of rubbish on the roofs of their homes to trick the world into thinking that there was an attack. “There is no doubt, however, from what we have seen and heard, that hundreds of shells and mortars have been fired at this place during the day. As I write this, the windows of the house we are in are still reverberating from the impact of a shell, probably in the next street. “It is true that people have been setting fire to rubbish in the streets. They believe it will confuse the guidance systems of rockets apparently being fired at them. They are probably mistaken. As we have long said on Left Foot Forward, something, something, must be done; how many more must die before our eyes? Using what? This will require ground troops, but is anyone seriously proposing foreign ground troops in Syria – let’s rally Syrians round that flag folks! I can’t possibly imagine what would go wrong when foreign ground troops are deployed. Good God, why didn’t we do this years ago? Let’s also note that the UN will never approve this – because Russia and China are quite happy to keep their friend Assad in power, as Weiss himself notes – so any intervention will be illegal. How are we going to get thousands of foreign troops in position? Or are we relying on the Arab League? How ‘limited’ will a ‘safe area’ be? Wouldn’t it be easier to open up the borders of neighbouring nations to refugees? Won’t crowding vulnerable civilian targets into a single location leave them just as vulnerable to attacks? The whole idea is ludicrous and impractical. The most defensible proposal, but still fairly stupid. How do we know who the rebels are? How are these going to be delivered? Is it not somewhat hypocritical to castigate the Iranians for supplying arms to Assad and then merrily throw guns at people whose organisation and membership is still rather unclear? Isn’t this just giving Assad even more of a reason to carpet bomb civilian areas? How exactly are other Middle-Eastern states going to react to this sort of interference – and remember, their cooperation will be required for it to work. How ‘advanced’ are we talking about? How do we sustain supply chains for a conflict which by its very nature seems fluid and without fixed front-lines and respective dispositions? We saw in Libya that the no-fly zone had almost no effect on the mobility of Gaddaffi’s forces. It was only after NATO started conducting ground attacks that momentum shifted. That will require immense coordination and without the grounds of self-defence, will also be illegal under international law. Let’s also consider how, in urban areas where most of the fighting takes place, we’ll be able to accurately distinguish between Syrian army personnel, pro-government militias, anti-government army personnel and militias, and civilians. Easy eh? Let’s just finally remind ourselves that the main opposition grouping has come out against intervention. Also, let’s remind ourselves that, appalling as the Assad regime is, military intervention is a blunt instrument, with no guarantee of success, that runs a substantial risk of killing tens of thousands more innocent people. There are more effective economic and military sanctions that can be levied against Syria. Suspending currency convertability anyone? What I find repulsive is the attempt to blackmail readers into supporting military intervention. This is not a simple ‘Do Nothing’ vs ‘Bombs Away!’ argument. There are better ways of supporting the Syrian revolution than throwing thousands of foreign troops over the border. Has everyone suddenly forgotten Iraq for God’s sake? Ignoring international law because it feels right is as clear an example of the truth of the old saying ‘The road to hell is paved with good intentions’, as you’ll ever come across. On reflection, that was a bit harsh. I sympathise with Shamik Das, but treating military intervention as a wholly feasible and straight-forward process is misguided and will prove harmful in the long-run. It damages international relations and makes consensus on wider issues harder to reach. I’m not advocating inaction, but military solutions are simply not feasible. The full-scale military assault on Homs being perpetrated by the Assad regime is precisely the kind of outrage that the West claimed justified its intervention in Libya (News, Feb 6). As this illegitimate, brutal dictatorship perpetrates crimes against humanity on an industrial scale in an attempt to snuff out the pro-democracy movement, we are seeing writ large the predictable and tragic limits of the so-called “Cameron-Sarkozy Doctrine”. To predicate intervention on a precise set of criteria such as the support of the neighbouring countries and regional political bodies, that there be an authorising Security Council resolution and that no ground troops be deployed, is to leave civilised countries impotent, left blustering and issuing edicts about economic sanctions as brave, innocent believers in freedom are slaughtered. Tony Blair was pilloried for his foreign interventions, yet he at least had the honesty to do what he thought was right, and refused to be bound by the false “morality” of those who regard the UN Security Council as the ultimate arbiter of the morality of international relations. 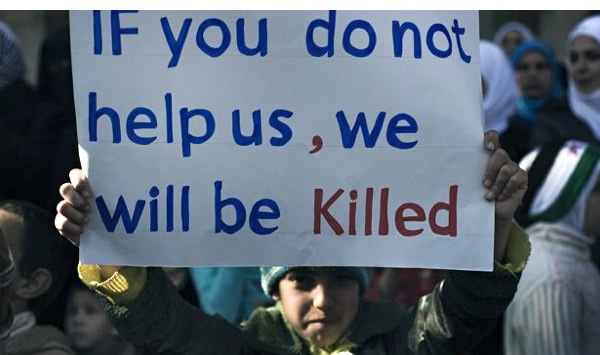 International “legality” must not be conflated with morality, lest we allow the innocent of Syria to join those of Rwanda, Bosnia and countless other examples where the powerful “legally” stood by, in the face of immorality on a huge scale.